Survey Korean name of railway stations in Korean OSM Community.
! [Seoul Subway, building sign of sangbong station (c) hyolee2] (https://upload.wikimedia.org/wikipedia/commons/thumb/a/ad/Korail_Sangbong_Station.JPG/800px-Korail_Sangbong_Station.JPG) Picture 1. Seoul Subway, building sign of sangbong station which is managed by Korail (c) hyolee2 CC BY-SA 4.0. The picture is posted to Wikipedia. Picture 2. Seoul Subway, poll sign of sngbong station which is managed by Seoul Metro (c) 박경수 Public domain. The picture is posted to Wikipedia. Almost of Koreans are familiar to spell name of railway station with a “-역(station)” and station name with “-역” is convention of web maps in South Korea. Also, sign of normal train station shows name with the suffix “-역(station)” in South Korea like picture 1. However, almost of station names in OSM has no word ‘station’ or similar words(except building names). and official Korean name of station has no “-역(station)”. Also, sign of subway station shows station name WITHOUT the suffix “-역(station)” in South Korea like picture 2. Note: Sangbong Stations is not devided by metro operators. You can transfer seoul subway lines with no charge, But sign is differ by operators. So there are some controversies among some users what is better to naming stations for Korean and that’s why I survey Korean name of railway stations. Because community of OpenStreetmap is not activated in South Korea, I survey about this subject for OSM contributors who have been edited South Korea and talk-ko mailing list. Result of survey is here (link). 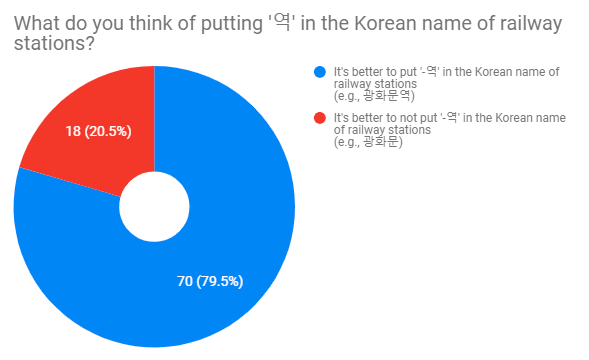 70 of people response that It’s better to put ‘-역(station)’ in the Korean name of railway stations and 18 of people response that It’s better to NOT put ‘-역’ in the Korean name of railway station. There are many reasons about the responses. I summarized responses and you can see response list at that link. Interesting point is that most of people, who response that it’s better to put ‘-역’ in the Korean name of railway station, explain reasons that It’s distinguishing between duplicate names like name of place if there are no suffix ‘-역(station)’ and It’s familiar to put the suffix ‘-역(station)’ on the station name for Korean. I don’t insist that we should put the suffix ‘-역(station)’ to the Korean name of railway station. This survey is just for collecting what contributors think about this subject. I posted a question about the Korean name of railway stations to OSM forum(link). I’m cross-checking replies of the survey and collecting many information about station name in South Korea. I want to more discuss about this subject with OSM contributors. P.S. picture of Wangsimni station is broken. I replace example to sangbong station. 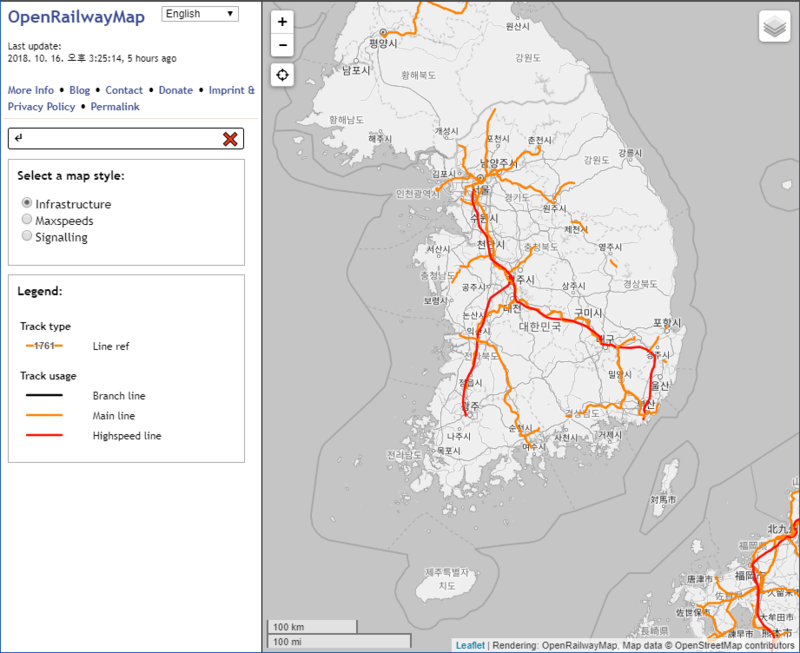 I found broken railway tags in South Korea at OpenRailwayMap. For three weeks, I updated railway routes of main and branch lines in South Korea. It was the most hard work in my mapping experience. Thanks to the OSM Telegram Super Group and Korea Group for helping with the mapping. OpenRailwayMap에서 한국의 철도 태그가 깨져있는 것을 발견했습니다. 그래서 3주 동안 간선과 지선 철도를 업데이트했습니다. 개인적으로 매핑했던 것 중에서 가장 힘든 작업이었습니다. 매핑에 도움을 준 OSM 텔레그램 그룹과 한국 그룹에 감사드립니다.